You can get how to use Atomized e-liquid/e-juice from here: how to fill e-liquid/e-juice to the cartridge, atomizer, cartomizer or clearomizer, ect. 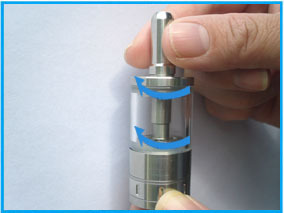 You can directly drop 2-3 drops e-liquid to the e-cigarette e-liquid, the atomizer will produce heavy vapor. 1). 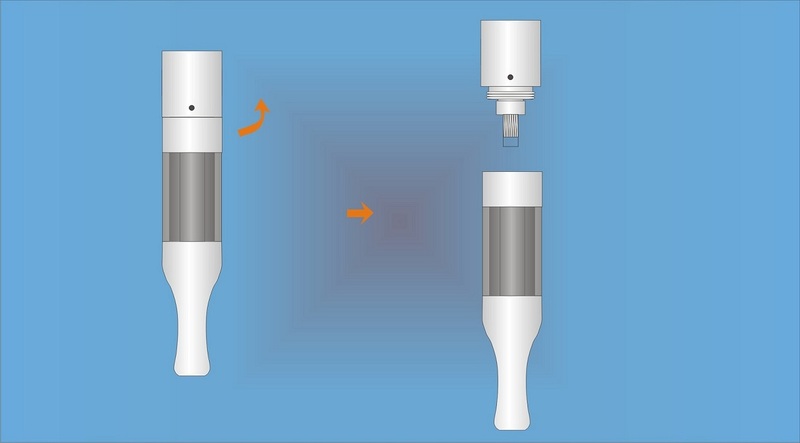 Draw the E-liquid inside the Injector. 2). 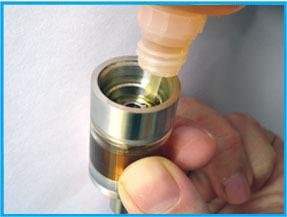 Inject from the bottom until the E-liquid comes up to top. 3). 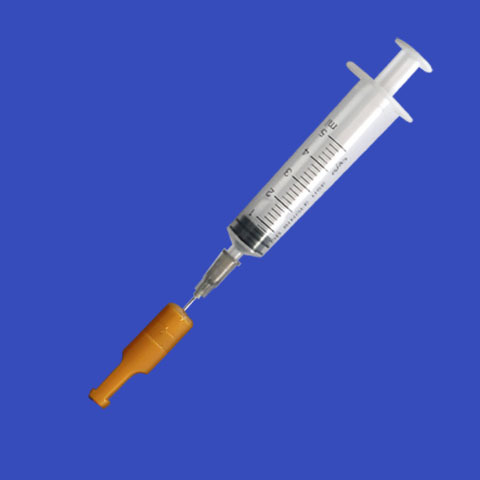 Put the syringe into the bottom of the blank cartridge, and fill the e-liquid. One new blank/empty 103C/510/eGo cartomizer holds about 1ml e-liquid, but we suggest you do not fill more 0.9ml e-cigarette liquid one time, and if your old 510/ego cartomier still can work, you can refill the e-liquid again too, for one old 510/eGo cartomizer, please do not fill more 0.4ml one time. A 510/ego cartomizer is one piece cartridge and atomizer contained in a single unit, for filling the e-cigarette e-liquid, you need to remove the 510/eGo cartomizer’s rubber cover first. After remove the 510/eGo cartomizer’s rubber cover, you can find there has a plastic white cartomizer cover (not gold parts) on the top of the cartomizer, take out it. After take off the cartomizer’s cover, you still need to take out the rubber washer. Now, you can draw the E-liquid inside the syringe, put the syringe into the side(notice: not the center) of the 103C/510/eGo cartomizer. Reput the rubber washer to the filled 103C/510/eGo cartomizer, the plastic cartomizer cover, the new filled 103C/510/eGo cartromizer is finished now. ---4. Fill the e-liuid to the e-cigarette eGo-T/801-T/901-T/510-T/BE112-T tank cartridge. Step 3: Take off the tank cartridge plastic cover. Step 4: Cover the cartridge plastic cover again. ---5. Fill the e-liuid to the pen style e-cigarette eGo-W F1 (clearotimzer/ transparent/ atomizer/ CE3 Giantomizer). Step 4: Fill the e-liquid to the eGo-W F1 clear cartomizer. ---6. Fill the e-liuid to the e-cigarette eGo CE4/CE5/CE6, E-Smart, etc, Clearomizer/Cartomizers. 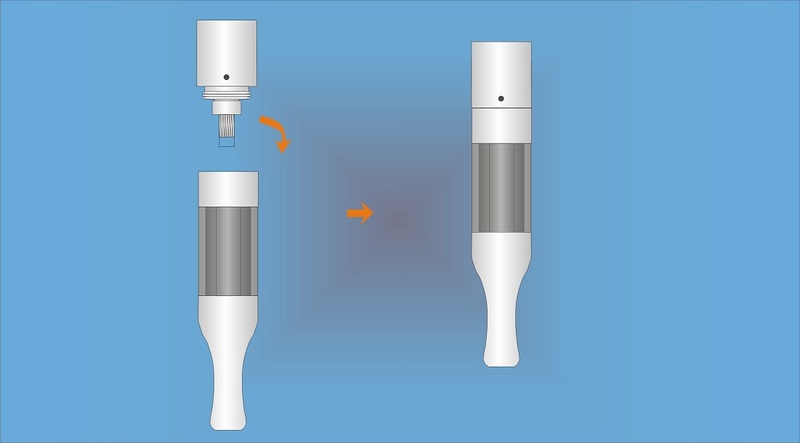 Step 2: .Using an e-liquid bottle or syringe, fill the CE4/CE5 cartomizer by inserting e-liquid down the side wall (Do not fill e-liquid in the center hole, that is for air flow). ---7. Fill the e-liuid to the e-cigarette Mini protank, H2, E-Smart BCC, etc, BCC or BDC Clearomizer/Cartomizer. Step 1:Unscrew the bottom base from the tank. Step 2: Fill the e-liquid to the tank tube. 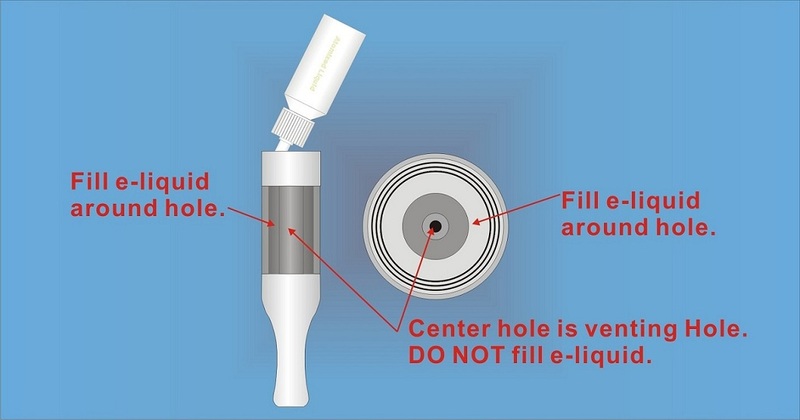 Using an eliquid bottle or syringe, fill the tank tube by inserting e-liquid down the side wall (Do not fill e-liquid in the center hole, that is for air flow). Step 3: Screw the bottom base back into the tank tube again. ---8. 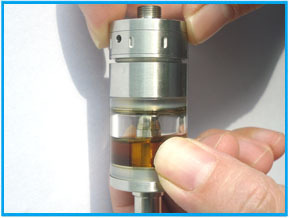 Fill the e-liuid to the MEGA Clearomizer/Cartomizer (same as: Aerotank MEGA, Nautilus ect) . 1: Check to make sure each parts of Aerotank MEGA Tank be screwed tightly each other. 2: Screw the Airflow Adjustemnt Base off the tank. 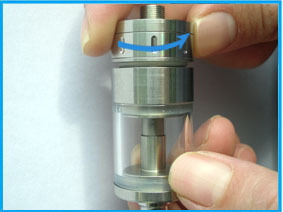 3: Fill E-liquid into the space between the Glass/Stainless Tube and the center metal tube. 4: Screw the Airflow Adjustemnt Base onto the Aerotank MEGA Tank again.